During the month of February, I’ve had the pleasure of preaching two times in local churches, and I still have one more time to go on the 26th. I say that it is a pleasure, and it is. I’m honored to be invited to speak at churches, and I’m pleased that my Spanish is to the point to where I can communicate somewhat clearly. Even though I enjoy doing so, the process is quite the challenge! Normally on Monday or Tuesday of the week before I preach, I begin to pray and seek what passage should be my focus. Oftentimes I go to textweek.com to find out what the lectionary passages are for the week, to see if there are any possibilities there. I find that it’s better for the passage to choose me than for me to choose the passage! Even so, day one of sermon prep generally ends with me having read five or six passages without really honing in on one. 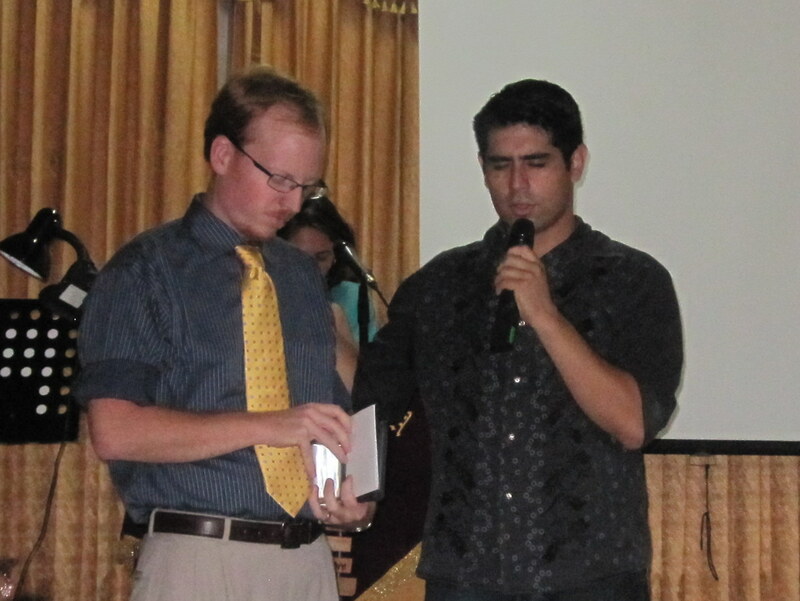 Here I'm being prayed for before preaching at the Centro Misionero; this is a prayer that is very necessary. Day two of sermon prep generally finds me choosing a passage to focus on. Sometimes I feel God leading me to a certain passage or topic. Other times the pastor of the church we’ll be visiting has a theme for the service which facilitates this process as well. I have to be honest, though, and say that sometimes I choose the passage that seems to have the most material available online, hoping and trusting that God can speak through my feeble efforts. Panic strikes when I realize that I only have two days left until Sunday, and in that time I have to come up with something to say, that will speak to a congregation that, in some situations, I don’t really know. That would be a challenge in any given situation, but I find myself struggling even more with the fact that I must speak in a foreign language. The next couple of days find me feverishly writing, or shall we say trying to write, about a topic I wish I had more time to study and in a language I wish I spoke more proficiently. In the end, I have a sermon which I hope will communicate in some way to a people I barely know who live in a culture we’re still trying to learn. And then, in faith, I let it go. The words leave my mouth, sometimes willingly and sometimes stumbled upon, but they leave none the less. Then I hope and pray that something I said, regardless of how I said it, speaks to someone, inviting them to a deeper participation with God in God’s Kingdom. When I finish speaking I sit down, and I ask Bekah, “How’d I do?” I’m sure she’s tired of hearing that question; I should probably let it go and simply pray that God speaks. Honestly that is the only thing to do, to pray that the Holy Spirit guide the mispronounced words to where they need to go. I guess, in a way, this should be our stance whenever we preach or teach. Do the best preparations we know how, then, in faith, speak the words knowing that the true communication is up to God and the hearer. Being forced to do so in a foreign language is just a gentle reminder that God is the active party, and our job is simply to speak, and in faith let God do the rest. Last night I was reading about the fear of failure in Angie Smith’s book, WHAT WOMEN FEAR. In part of the chapter she wrote about God’s calling of Moses. Moses tried to back out because he was slow of speech. The Lord responded, “Who has made man’s mouth?…I will be your mouth, and teach you what you are to say.” And I believe that is what God is doing through you. He can even use the stumbles and fumbles as you try to express in Spanish the message He’s placed on your heart to share. The only way you fail is to not do what God’s called you to do. As long as you are faithful in your preparations and speaking, you are a success in God’s eyes because you are doing exactly what He’s called you to do. He’ll handle the rest. I hope you know how proud I am of you. I’m praying for you and Bekah. Love ya! I only write this because you know I love you and please take what I say in the spirit it is given. I had to laugh as I read your heart wrenching week as you prepare to do your best for Him. I think we have all been on a similar road as you are experiencing as you share your fears of failure with your readers. We all know that God laughs at us as we plan and prepare to “WOW” our listeners whether it be preaching or teaching a Sunday school class. Remember He is going to do what He wants to do and all He wants from us is to be obedient. Sometimes it takes a long time for us to learn that lesson. Of course we need to do our best for Him, but leave the results up to Him, since we are just His mouthpiece and He will open or close not only the ears but the hearts of our listeners. Keep on keeping on brother and sister. We want to encourage you at each step as you share your heart with us. We love you and feel as if we are partnering with you in God’s work there.